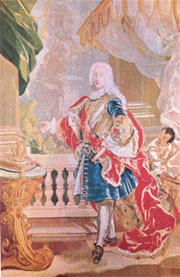 Only three years after his triumphal entry in Naples in 1734, King Charles of Bourbon decided to establish a tapestry factory under the direct control of the Crown. He had a clear desire of building up – from every point of view – a new and autonomous kingdom of which he had to be the founding sovereign. In the historical area of this site, under the heading dedicated to Charles of Bourbon, we have already shown how brilliantly he succeeded in doing this and we have described the main artistic, cultural and social initiatives he undertook to modernise and improve his kingdom from a cultural point of view on one side and increase the fame and glory of the new Bourbon dynasty of Naples and Sicily on the other side. His decision of opening a tapestry school in Naples must be understood from this perspective, also taking into account that all along his kingdom he was the undeterred builder of sumptuous palaces (the Royal Palaces of Capodimonte and Portici and most of all the Royal Palace of Caserta, just to mention a few), factories which then became famous all over Europe (such as the factory of chinawear in Capodimonte), State Schools such as the Neapolitan Academy of Drawing, etc. These buildings needed an adequate furnishing (the Royal Palace of Naples, in a state of neglect, must be completed and modernised). It was therefore clear that the tapestry weaving had a key role to play since its works were present in all royal and noble palaces of Europe. Moreover, Charles was very lucky in the implementation of his project. 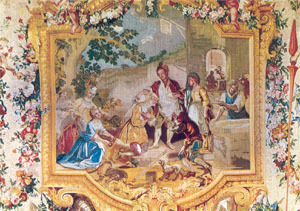 In fact, on 5 October 1737 – soon after the death of Giangastone de’ Medici, the last Grand Duke of the Florentine family – the famous Tapestry Weaving established by Cosimo I in 1546 was suppressed and all artists and workers were left without a job.The King was really able to seize the opportunity and, «with unquestionable opportunism and exceptional timeliness», immediately hired the best among them by giving mandate to the Prime Minister of the Royal House, Gioacchino di Montealegre, marquis of Salas, to take direct commitment in the building of a Neapolitan Tapestry Factory (Which is undoubted evidence of the King’s clear interest). Montealegre appointed the marquis Giovanni Brancaccio (future Prime Minister) as Supervisor to the Royal Tapestry Factory to be built and tasked him with the purchasing – though with the limited means of that time – the necessary equipment to begin the construction. Domenico Del Rosso was appointed as Director of the factory and G.F. Pieri was appointed as Administrator. They had been both former directors of the Florence factory. With the help of young apprentices who worked without a salary, they were able to establish the first core of a real national school. The chosen seat was a building belonging to the monastery and Church of San Carlo alle Mortelle, previously chosen as seat for the Laboratory of Hard Stones and then seat of the Neapolitan Academy of Drawing. 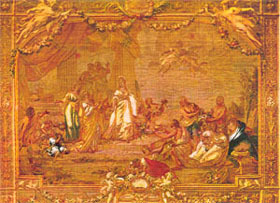 In 1739 the tapestry depicting the Portrait of Charles of Bourbon, today in Capodimonte, was almost finished and another one was begun to depict thePortrait of Queen Maria Amalia of Saxony. In 1740 Montealegre and Brancaccio issued an official statute, ruling the working method, the firm administration and the treatment of workers. The whole work was organised and directed by a master acting a s Director, who was responsible for the entire factory and directly submitted only to the supervisor and the Sovereign. He was helped by a Guardian, a Dyer, tasked with the dyeing of yarns, and a Writer, fulfilling also the functions of a treasurer. The Guardian was also tasked with the delivery of the requested material to the Director or Dyer, had to report to the Writer about this delivery and collect the money to pay the workers. The Writer had to keep a complete inventory of al purchases and inform the Sovereign of the expenses borne by the Factory . The Director had to be at the factory one hour before the workers and leave it only when the working day was over and all personnel had left the factory. A working day lasted from 8 to 12 hours, with a short break in the afternoon. Any mistake had to be repaired by the worker who had caused it; if this was not possible, the equivalent amount of the damage had to be deducted from that worker’s salary. Each worker, however, could express to the sovereign, via the supervisor, those situations of which he was not directly responsible and that could be prejudicial to the good functioning of the factory. From 1752 on, the very fast progress made in the construction of the Royal Palace of Caserta marked the “turning point” in tapestry production. In this case, Charles and Vanvitelli decided the subject of each tapestry and its final place. In particular, the King wanted the series of tapestries depicting the Histories of Don Quixote to be completed. The manufacture of this series had been started in the Factory of Gobelins between 1730 and 1735, donated by Louis XV to the Duke of Campofiorito, who in turn had donated it to Charles. In 1757 the Roman Pietro Duranti received this important task. He was an expert in this field and could hire new tapestry makers since it was clear that Charles wanted to improve the quality and therefore many tapestry makers were called from Rome and Turin. The great quality improvement of those years was especially due to Duranti – who was however advised by Vanvitelli. Other important series of tapestries were weaved; among the most beautiful ones, we must mention: Allegories of Virtues 1763-1767), destined to the Belvedere Room at the Palace of Naples; the myth of Eros and Psyche (1783-1786); the Events in the Life of Henry IV, etc. 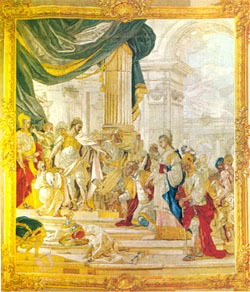 In November 1778 the factory was moved and located in some rooms of the Royal Palace of Naples, where in those years Durante completed a tapestry depicting Cleopatra. Unfortunately, during the sad days of the Neapolitan Republic in 1799, huge damage was made to the factory and this also marked the end of the tapestry school. The last series of tapestries – six tapestries dedicated to the Royal Apotheosis – date back to the ‘90s . In total, the factory produced 213 tapestries. An artistic patrimony of an immense value.